Spiezia Organics (in spite of its Italian name derived from Dr Spiezia the original creator of the Spiezia range!) 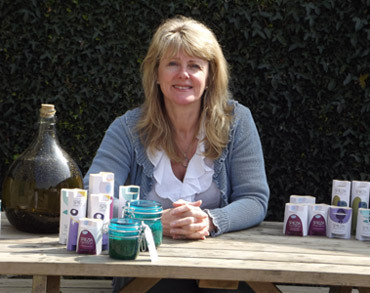 is a truly British and truly organic skincare brand that is Made for Life. Based in Cornwall, at the Health & Wellbeing Innovation Centre Treliske, we hand-make a full range of skincare and some homecare products using 100% organic herbs, flowers and oils utilized for their natural healing properties and synergy with the skin. We are stocked throughout the UK and export globally. When you took over the company it was facing insolvency. How were you able to turn it around? By being analytical about who we were supplying and whether it was viable to continue providing some of our stockists with our products at the margin they were being given. Being bold and putting my money where my mouth was and investing in a rebrand to really raise the profile and perception of the brand to make it more accessible and appealing. Restructuring the business and overheads to reduce costs and manage it more effectively. Having utter passion and belief in the brand and the products and making sure that anyone who came into contact with Spiezia understood what we were about. Why do you think there has been an increase in consumer demand for organic products? There is a much greater awareness of ingredients in skincare from a larger audience and consumers are now more discerning about skincare ingredients. The Soil Association 2013 Annual Report has reported a 5.6% increase in 2013 for certified organic Beauty and Skincare products. This requirement for certification rather than for the ‘fake’ claims made by some skincare products of being Natural & Organic was enhanced by the national media coverage in September 2013 generated by the Trading Standards prosecutions of some leading companies making claims of being organic. This has given certified producers such as Spiezia Organics further credibility. What are the largest challenges you face in staying competitive and while still being profitable? Managing cashflow effectively and ensuring that any investment in the business is really researched to ensure that it will provide the company with a good ROI. Managing ordering and ingredients costs so that we can maintain our prices to customers whilst also retaining the margins required to make the business profitable. Increased competition within the skincare market, particularly from companies who are labeled organic and/or natural but who are not certified. The greatest challenge here is making sure the consumer knows what and who we are as a brand and what our ethics are. I find eating our skincare products is a GREAT way to get the message across! Please tell us more about Made for Life. What inspired you to found it? Spiezia Organics was invited by the Mermaid (Breast Cancer) Centre to go along to a ‘Moving Forward Day’ in 2008. Talking to the women there who were going through cancer was really inspiring. It put life into perspective and I wanted to do something to make a difference. Made for Life provides integrative support through days out where people going through the cancer journey and their careers could meet, ‘escape’ from hospital treatments and just relax, be creative at art workshops, relax with meditation or massage, reiki or reflexology and have some space. Made for Life is based at the Health & Wellbeing Innovation Centre and we have a Therapy Room here; Wendy Everhard (breast cancer survivor and Manager of Made for Life) organises events every month and a drop in facility for anyone who needs just a friendly face and some space. By sticking to the Motto that Family comes first! I always make sure that I drop my two girls off at school and pick them up and we always have tea together as a family and a really good catch up at the end of each day – definitely not in front of the TV! We enjoy going to the beach in the summer and every night we have a hug and a catch up before they go to sleep. It takes real discipline to do this but your children aren’t there forever and making the most of the time you have with them is key for me. If necessary I work for a bit whilst they are doing homework or if there is a real deadline may work after they have gone to bed or get up early but very rarely. I am lucky to have a fantastic team at Spiezia who I confidently delegate work to and are an incredible support. Any advice for women thinking of starting a business? Do something you really love and are passionate about. Do your homework in terms of market research for your product or service. Ensure you take time to do some projections in terms of what you want your business to achieve in terms of turnover and more importantly profitability. Think about what you want to be able to take from the business financially and emotionally! Make sure you value yourself and product – cheap doesn’t mean best! It takes great courage to start a business and what I call the ‘pants of power’, so be prepared for some knocks, learn from them, bounce back and always be positive.